The first thing to know about God: God is love. The first thing to know about Jesus: Jesus fully shows us God’s nature. The first thing to know about the Spirit: The Spirit of God gives life. The first thing to know about people: We are all broken and hurting and longing. The first thing to know about hope: Hope is persistent. You’d have to work to snuff it out. The first thing to know about love: Love is kind, and durable. The first thing to know about church: The church is God’s doings, not ours. The first thing to know about church people: They are common folk undergoing renovation. The first thing to know about forgiveness: Forgiveness is the most difficult necessity in life. The first thing to know about yourself: You are not, and never will be perfect. The first thing to know about life: In every instance, it is a most priceless mystery. The first thing to know about pain: It has no memory. The first thing to know about sinners: They like to hide in mirrors. The first thing to know about evil: It is real, and it is hollow. The first thing to know about peace: It does not depend on external circumstances. The first thing to know about resurrection: It changes all the rules of the game. The first thing to know about serving others: You end up getting more than you give. The first thing to know about healing: All cures are temporary; only healing endures. The first thing to know about salvation: While for you, it’s about a lot more than you. The first thing to know about joy: Joy is shy, showing up when you’re busy with something else. Amazingly, for a small-framed girl, the youngest of nine children, born on a non-descript farm, in the impoverished rural upcountry of South Carolina, Joclair Ellenberg’s life became an epic journey. Although she did not travel the world, she traversed regularly a vast landscape of faith. Though she did not subdue mythical beasts, she saw her family through many trials with unwavering hope. And though she did not brandish a sword to conquer, she won many hearts with selfless love. Her life was an odyssey – of faith, hope and love; these three, the greatest of which was her love. Joclair did have an adventurous spirit. She was continual learner. She wanted to experience new things and to go see what was around the bend in the road. She was not afraid to “live large,” as they say, but that’s not why she took the risky trip to New York. She knew it would accomplish two things: she would see three sets of grandchildren she might not otherwise see, and even more importantly, she wanted to demonstrate to all her grands, that you don’t give up. Such an attitude characterized the journey of her life. You took what life gave you, you discovered its beauty, you trusted God, and furthermore, you improved what you could. She had such a strong sense of determination that sometimes, it showed up as stubbornness. But don’t be mistaken, that resolve was built on hope, the belief that things could be better. It’s what got her through the sudden death of her father at age 14. It’s what led her to learn to walk again and even play the piano again after a major stroke. It’s what got her through her losses as those so close to her died. “Southern steel,” some might call it: you don’t quit. Her journey was indeed one of adventure and hope, but that’s not what she would want to be remembered for. We could talk about her love of music. She played the piano so effortlessly, improvising and transposing a hymn to any key. She taught each of us to play as well, and insisted we practice. She would call out from somewhere in the house if we missed a note, or had the wrong tempo, or simply needed to clean up a passage. At Christmas and other occasions, the only present she really wanted was to hear us sing together. Taylor gatherings have been legendary as musical events, all because that’s what Mom enjoyed, and expected. We could talk about Joclair’s creativity. Children of three generations have gone to sleep with amazing bedtime stories. She drew, cut out silhouettes, wrote poems, and expressed herself eloquently in letters. To her chagrin, we could talk about how prim and proper she was. Even around the house, she was not going to be dressed shabbily. And each outfit required some appropriate piece of jewelry. We could talk about the love of her life, Houston Taylor, their 65 years together, and her devotion to him in his career and ministry. We could talk about family and what a godly mother she was. But, what she would want us to talk about, would be faith. And with your forbearance, that is what I will do. I will highlight the five pillars of Joclair Taylor’s faith. First of all, she had a Solid Belief in God’s Providence. This was the bedrock of her faith. She knew without a doubt that God IS concerned with our lives, that God is ABLE to provide for our needs, and that God WILL provide according to his good will for us. One of my earliest memories was Mom teaching God’s providence to my brother Houston and me through the story of the Exodus. I was only five, and Houston had to stay home from school as we both battled the measles. For a week, the extended sleeper sofa became the land of Egypt and the Middle East. Plastic Army men became the Hebrews and the Egyptians, and they traveled on carts and chariots made of construction paper. A blue towel was the Red Sea, which indeed parted at the right time. A ball of cotton led the Hebrews by day and a flaming candle stood over then by night. Bread crumbs fell from the sky like manna, and all the way, God provided. Mom did not underline or mark many passages in her Bible. I wrote down the twenty or so that she did. One was Psalm 27:13-14which expresses her solid belief in God’s Providence: I believe that I shall see the goodness of the LORD in the land of the living. Wait for the LORD; be strong, and let your heart take courage; wait for the LORD! God’s faithful provisions, however, didn’t mean you that you could waste anything. Growing up during the Great Depression and years of wartime rationing, she knew the importance of making things last. As her children, we were schooled in reduce, reuse and recycle, long before it became fashionable. We know how to re-flatten tin foil, wash and reuse bread wrappers, and save everything. She taught us to tear napkins and paper towels in half so they would last twice as long. She made a six-pack of Coca-cola serve our whole family by tricking us into believing that a glass of one-half Coke and one-half sweet tea was actually delicious. God provides, but don’t waste. The second pillar of Joclair’s faith was a dependence on the Word of God. She loved the Bible. To her the scriptures were dear friends and a means to commune with Jesus. Like the revolutionary Mary of Luke’s gospel, she sat at the feet of Jesus, choosing to be a disciple, ignoring social norms if necessary, in order to learn more. One of the things she greatly missed after Dad’s death, she told me, were the times they would sit together, usually after breakfast, and discuss the Bible. She was so inquisitive. I know, because she began “saving up” her queries for my visits: questions about universal salvation, the purpose of the sacrificial system of the Temple, the means of sanctification, and a right reading of the early Genesis stories. 1 O God, you are my God, I seek you, my soul thirsts for you; my flesh faints for you, as in a dry and weary land where there is no water. 4 So I will bless you as long as I live; I will lift up my hands and call on your name. The third pillar of Joclair’s faith was an attentiveness to the needs of the least. A hallmark of Jesus’ ministry was his attention to the poor, the oppressed, the lost, and the least of these. (Luke 4:18, Luke 15, Matthew 25) Joclair demonstrated a similar focus in her own journey. In a large family gathering, you would find her seeing that the little ones were taken care of, or she’d be on the floor playing with the youngest. For her, fairness didn’t mean equality, but that the differing needs of each person were met. She was always alert to identify and resolve potential problems, before they became problems. She taught us to give, especially to those who could not give in return. She taught us to be in mission to others. In their younger years, she and Dad led summer camps for youth, and in retirement they were site leaders for a couple of years at a Salkehatchie camp. It is beyond my ability to count the number of mission trips that have been taken by and led by members of the Taylor extended family. Mom probably didn’t know the number either, but she would remember the trips you’d been on. She supported them financially, prayed for them, and when you returned, she wanted to be debriefed. In the van on our trip to New York just last week, she sat looking at pictures on Lauren’s computer of Lauren and Daniel’s recent trip to South Africa, asking question after question. She sought imitate her Lord with her attentiveness and service to the least and the lost. The fourth pillar for Mom was her assurance in knowing Jesus as her Savior. One scripture underlined in her Bible was Romans 5, verses 1 and 2: Therefore, since we are justified by faith, we have peace with God through our Lord Jesus Christ, through whom we have obtained access to this grace in which we stand; and we boast in our hope of sharing the glory of God. She had an evangelical heart for others, but she despised revivalist manipulations. Once we talked about the way preachers in some traditions would try to get people to come to the altar. We’d also been talking about reaching young people with the good news, and so I asked her about her experiences of altar calls when she was a teenager. One year ago today when the hills were ignited with the beauty of death, Houston left this world. But as in nature spring explodes with a glorious resurrection of color, so also we have an assurance of an eternity with Christ and with loved ones, a beauty and joy impossible to comprehend!! 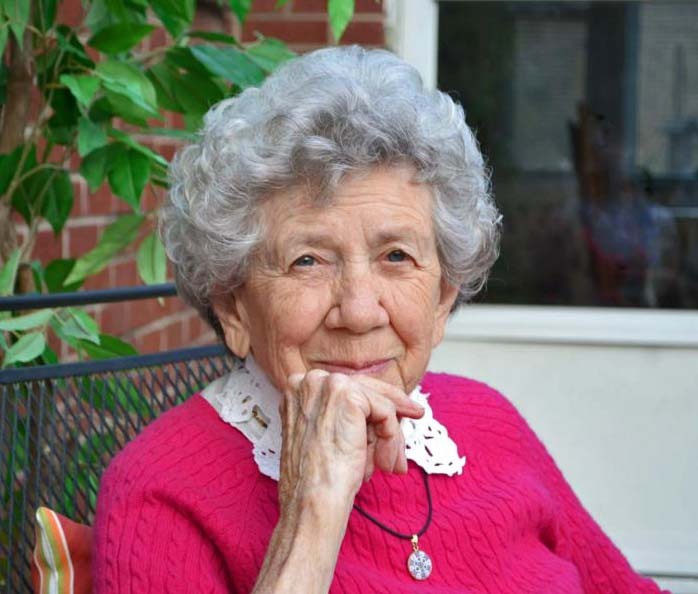 Joclair Ellenberg Taylor’s life was an epic journey of faith, hope, and love. Let me close with this. Sometimes in teaching I ask the rhetorical question, “If you could boil the Bible down to one message what would it be?” For me, that one simple summation would be this: The One who knows me best, loves me the most. John 15:13 No one has greater love than this, than to lay down one’s life for one’s friends. Joclair Taylor made it her business to know you. We experienced that as her children, and grandchildren and great-grands, but she extended such loving interest to friends and church members and even to strangers she’d meet. She had that rare ability to focus on the individual. In her presence you knew you were seen by her, and heard by her, even if distractions were all around you or the room was full of people. As her children, we knew (and were told) she did not always approve of our behavior or choices, but we also knew, without a doubt, that she loved us. She made incarnate (clothed in flesh) the great love of God, for through her love, we have learned that the One who knows us best, loves us the most. And such love is eternal. Thanks be to God for this petite powerhouse, a woman of faith, hope, and love. Amen. While pumping gas recently, I watched a young man drive up and noticed he was wearing ear buds. I always thought you weren’t supposed to wear your ear buds in the car, at least not both of them. Seems that instead of listening to his music, the driver might need to hear the car horn of the person behind him! Just another instance of distracted driving maybe. Anyway, this person got out and started pumping his gas into his car, ear buds intact. All the while, he swayed up and down, back and forth to his beats. The deed done, he hopped back into his car, and somewhere in his own world of music, he sped off. I love music, and listen to all types of music. While I’m working in the office or outdoors, I’ll have music playing in the background. And I confess, I do have my own iPod and ear buds. But the brief encounter with Mr. Earbuds had me thinking about the way we we’ve become unaccustomed to silence. Music, or radio chatter, or television confusion fills our environment, whether at home or in the car or at a store. More than any previous generation, we spend our days in a sea of sound. And what do we know of quietness, of silent waiting and prayerful expectation? We need time of silent waiting, alone, when the busy intellect is not leaping from problem to problem, and from puzzle to puzzle. If we learn the secret of carrying a living silence in the center of our being we can listen (for God) on the run. The listening can become intertwined with our inner prayers. Just exactly when are we silent before God? Is our prayer time not just a time to tell God things, but also to be in silence? We say we want to hear from God, but do we make time to sit and listen for God? When in worship do we fall silent before the majesty and goodness, and grace and power and mercy and mystery of God? At our staff meeting this week, we read a passage from the writings of Dietrich Bonhoeffer. He wrote, “We are silent at the beginning of the day because God should have the first word, and we are silent before going to sleep because the last word also belongs to God.” Not bad advice, I’d say. Or maybe I shouldn’t say. Maybe I need to be silent now as well, and just listen. How about you? I saw the traveler from the shelter of my porch. What my erstwhile invitation might mean. As he looked, then turned aside to join me. But did not remove his tattered coat, or hat. He nodded a thank you but held his words. To become a wet heap upon the floor. We breathed the saturated freshness in the air. And barely heard the escape of a ragged sigh. Here was a real person, deserving compassion. From a stranger on the road, to this man on my porch. Still wet and worn, without a place to be. As he became my Samaritan’s responsibility. Like a stray kitten petted, then kicked from the door. Then went to the kitchen to prepare us some tea. With chicken salad sandwiches, and some scones I’d saved. He’d shed his coat and dried his gray, wiry hair. Set the table with linens, and pull up two chairs. Then upon my invitation, sat down with me to tea. Warmed our chests with drink, and ate relentlessly. Leaving behind family, and hope, and symbols of identity. Life’s chance opportunities, and the harshness of the road. And I realized I did know him, and not just by name. And as if by his stares, the rain cowered and ceased. While I took some bills from my wallet to share. By sending this traveler to the shelter of my porch. Earlier in March, I spent a day with my Clergy Covenant Group hiking a portion of the Palmetto Trail. All ministers are expected to be involved in continuing education and one option is to be part of a monthly small group gathering of peers for discussion of ministry issues and mutual support. My group prefers to have its discussions outdoors while on the trail, or sitting around a fire or dinner table afterwards. Our coordinator’s email said the hike would be strenuous, but only 3.5 miles long, which was good since the weather called for a mixture of rain and sleet for the area. Actually the Blue Wall passage is 13.5 miles long. He forgot to type the “one”, and we just went right along with it. So, our two to three hour hike up and down a mountain turned into an all day hike, half of it in mist and half in light sleet. For me, it was a real struggle. About six miles into the hike my thigh muscles began to lock up with cramps. It became painful to take each step. I had made a common amateurish mistake – in the cold weather I didn’t keep drinking water and my body had become dehydrated – and thus, my leg muscles rebelled. If I had been alone, I would have been in a crisis situation in the wet cold. Fortunately, my fellow hikers stepped in to see me through. One took my back pack to carry and another took my camera. Another replaced my bottle of plain water with one containing electrolytes, and someone gave me a banana to eat. I was handed a walking stick to steady myself and then they all slowed the pace to match mine. We trudged along and a couple miles later I was doing OK, tired, but my legs were working again. Feeling bad about the incident, I apologized to my friends. “What do you mean?” one said, “It’s just pay-back for the times you’ve carried our stuff.” I still felt foolish for not staying hydrated, but I left it at that, and just said a word of thanks. Lessons from the day had me thinking not just about hiking, but also about life together as God’s family in the Church. First of all, check the route and distance for yourself! Are you relying on someone else’s preparations for life or have you taken care of it yourself? Secondly, stay hydrated! I thought I was doing fine, but my body desperately needed water. Likewise, in our faith walk, a lot of people think they can do without worship and Bible study, and still maintain spiritual strength. Guess who’s going to end up with spiritual cramps? Thirdly, be honest with your companions. I had to stop, admit my mistake and say, “I can’t keep on like this.” That opened me up to receive the help they were glad to offer. But how often in our church life do we mistakenly keep the problem to ourselves out of pride, stubbornness, or whatever? And finally, be ready to step in and take action. Truthfully, my companions had to “take” my pack from me. With dehydration and the early stages of hypothermia, one’s thinking isn’t always clear and rational. They took a no-nonsense attitude with me to get me back on track. Admittedly, this is a tough one in the church. Most of us don’t want to “intrude” or seem to be judgmental. Yet, there are times when our companions are obviously not thinking clearly, times when we see they’ve neglected the basics, or maybe times when their behaviors signal a pending crisis. Is God’s grace strong enough in us to step forward and risk involvement? For the sake of the other person, are we willing to do as my companions on the trail did for me? It’s amazing the difference one person makes. My Dad’s brother had bought a new brick ranch house on the frontage road of the interstate, situated about three miles out of town. We were there on a Saturday evening to see the home and celebrate with them. All I knew was that we’d had a meal together and now I was bored with the conversations of the adults. My older brother, Houston, fit in age right between two of Joe and Jessie’s sons. The three of them wanted to pal around without the six year old tag-along, me. And usually they got away with leaving me behind, but on this occasion Mom had not given my older brother a choice, “Take Stephen with you,” she’d directed. So out we went, me scurrying to keep up with the big guys. We roamed around the yard awhile, then walked down the frontage road about a tenth of a mile to the overpass. It was early evening as we stood on the bridge, watching cars speeding by underneath us. Who thought of it and who started it I do not know, but someone proposed dropping a rock off the bridge to see if we could time the drop to hit a car. Today I shudder at the stupidity of the dare and the danger involved, but in my remembrance I don’t think six-year-old me gave any of that a second of thought. All I knew then was that I didn’t want to be left out of anything the older guys were doing. So, we found small loose rocks on the bridge and leaned over the railing, waiting for cars to come along. I don’t recall dropping a rock myself. I believe I was only allowed to watch as in turn the older guys stood in the prime position over the lane and timed their releases over the approaching cars. Fortunately their timing was not good, but unfortunately, they got better, quickly. In the first round the rocks hit the pavement after the car had safely passed underneath. But then a rock connected, with a windshield, with a loud smack, with a screeching of brakes, and with a panicked rush of three older boys knocking me down as they took off for the woods. I never saw it. I don’t know if the windshield broke or not, or if anyone was hurt. Of that fateful moment I remember most the brakes and the stampede. I was alert enough to jump up quickly and take off after my brother and cousins, across a field and into some woods. I didn’t stop running until well past the tree line, and might would have kept running except that my heart was about to beat its way out of my chest. In my hand was the rock I’d chosen to use but had never had the chance to drop. I quickly threw it down as if it were a scorpion in my hand. Hiding behind a tree, I listened for the others. I was afraid to call out, but also afraid of being alone. In a loud whisper I called for my brother. No answer. I listened intently, unsure what to do. I thought I heard some movement in the woods. Maybe I could catch up with them. Maybe they’ve found a place to hide I thought. So deeper into the woods I crept, moving from tree to tree, occasionally calling out in my whisper voice. No brother answered. No movement was heard. I finally realized it was getting darker as dusk progressed to evening, and I was getting further into unknown woods. I sat down and leaned against a tree trunk, breathing deeply to hold back the panic beginning bubble up within me. It’s up to me, I thought. I’m on my on. I’ve got to get out of the woods, back across the bridge and to Uncle Joe’s place before Mom and Dad start missing me. The others will have to fend for themselves. By age six I had played imaginary army games many times in the woods around my house and I knew I was up to the challenge. I stealthily began my journey back. At the tree line I paused. It was dark, but not dark enough. I waited for what seemed an eternity and then nearly jumped out of my skin when a car came slowly along the country road. Maybe it was the man in the car that got hit, looking for us. Rats, I thought, now I have to wait some more. When another eternity had passed, and no other car had come along, I left the woods. There was broom straw and stubble in the field and I was small, so I figured I had pretty good cover until I got to the ditch along the road. If the car came back along I would just fall flat until it passed. At the ditch I had to make a decision. From there I would be totally exposed, until I crossed the bridge and made it to the frontage road on the other side. My instinct was to run like hell. But, I thought, if I ran, and the car came back along, they would know immediately I was running because I was guilty. I decided to walk across the bridge, not run. I’d walk as if I was just walking to a friend’s house so I wouldn’t arouse suspicions. With that resolve, I stood, crossed the ditch and began walking. The bridge was only twenty yards away. I can do this, I thought. Then the lights came on, blue flashing lights. I whirled around and watched as out of a driveway up the road a highway patrol car quickly pulled out. I stood motionless, as if caught in a spider’s web, as it stopped beside me. The car door opened and the officer walked around to me. I immediately knew then and there two things for certain: first, I would lie to protect me and my brother, and secondly, I was going to jail. The officer got my name (I didn’t have a rank or serial number to give him, but if I’d had them, that was all he would have gotten because I knew from army movies that was all you had to give them). Instead I told him where I lived. He wanted to know what I was doing out there at night. Just walking to my cousin’s house. He said he’s gotten a report that some boys were throwing rocks off the bridge and I was the only boy he’d seen. Where were the others? I told him my cousins were with me earlier, but they’d gone on and I didn’t know where they were (which was the truth.) “Why were you throwing rocks? A man’s car was damaged and he could have been killed,” he demanded. I knew he was angry and I realized he didn’t ask if we threw rocks. I was guilty, caught, and condemned, but I lied. “We were on the bridge watching the cars and we kicked some rocks, but we didn’t throw any,” I submitted. He looked at me a long time. Then he opened the passenger door and told me to get in. He walked around, got in as well, and put the car in gear. Instead of taking me to jail, however, he did something worse, he told me to direct him to my parents. I showed him where to turn on the frontage road and pointed out the house where my parents were. As we rode he kept talking to me about the dangers of what we had done and how we were lucky that the windshield had only cracked, but that the rock could have gone through the windshield. It could have gone through the roof and killed someone. The blue lights were still flashing as we pulled into the yard, which, I thought, would have been cool if my brother and cousins had been there to see it, but in this case only added to the disaster as my Mom and Dad and Uncle Joe and Aunt Jessie and my sisters came out to see what was going on. While my Dad and Uncle Joe talked with the officer, my Mom and sisters just stared at me. I felt alone, suspended, while judgments were being determined. After a bit, I was questioned again, and I repeated my lie, the one about kicking rocks. I don’t think they believed me, but I stuck with it. To my surprise I was not arrested and the patrolman left without me. Also to my surprise I was not immediately punished by my parents. Some time later when my brother and cousins emerged from the woods, Mom kept me inside while Dad and Uncle Joe talked with them outside. When we got home that night Dad had a talk with me. I imagine now that it was about being truthful, or not following the crowd, or about not doing stupid things. I don’t know because at that time all I was thinking about was the spanking that was sure to follow. But there was no spanking, and I don’t know what punishment by brother received. He wouldn’t talk to me about it. I didn’t understand at the time, but he had to apologize to me for not taking care of me. He did finally tell me how they snuck across the interstate and were hiding in the woods after I had gotten caught, that’s the part I was interested in. And I wasn’t allowed to “tag-along” with him anymore. In fact, for a long time he didn’t get to go off anywhere to where I could have tagged along. Thus I learned early what it was like (in my own limited way) to be on the wrong side of the law. The downside was that it took several years, and several good encounters, for me to learn that police officers weren’t out there “to get me,” but to be a help to us all. The whole incident scared me enough however, so that I began to learn that you have to think about consequences. What will be the result of my actions? Do I want to be a part of this? I’m not saying that I ethically matured through my run-in with the Law. I don’t even think I felt much remorse at my lies. Alas, I may have even considered them noble in that they were to protect my brother and cousins. But I did learn that you better think about what you are about to do! Whenever I drive on Interstate 385 and pass under a certain bridge I am reminded of six-year-old me standing on the bridge, ready to go along with whatever, just to be accepted as part of the group. Inwardly chagrined, I smile to myself, hoping I have learned my lesson. Squash, tomatoes, string beans, more squash, lettuce, cucumbers, and more squash – these are a few of my favorite things! And they better be, at least right now! The harvest from my garden plot has started to come in and I have to say, there’s nothing like fresh vegetables from the garden! This is the first garden I’ve been able to have in several years. When you live in a parsonage, you don’t always have places to grow much more than a few tomato plants. But this year I tilled a small plot, about 18 feet by40 feet, of that wonderful red clay we all enjoy, turned in some compost from the Elrod farm, laid out five rows, and set out some seeds. The thing about a garden is this: you have to tend it, regularly. I usually get up very early, and when Cynthia gets up she will find me either upstairs in my study, or out in the garden. There’s always something to do, weeding, watering, or one of several other small tasks. Several years ago I was visiting with a member who was a master gardener. We were admiring her many plants when I suggested she could help me plan a flower garden. But, I insisted, it will need to require low maintenance, since I have very little time to devote to it. For anything to grow well, there must be someone to tend the growth, to prepare the soil and nurture the plants, to invest him or herself through “sweat equity,” and to lovingly provide the daily attention that is needed. We could name many areas of life where this is true: parenting, friendships, teaching, growing a business, or growing a church. The area I’m thinking about today is the hidden garden, the spiritual garden of our hearts. Is your hidden garden being tended in such a way that it is producing, or will produce the fruit of the Spirit – love, joy, peace, patience, compassion, goodness, faithfulness, gentleness and self-control (Galatians 5)? You are the gardener of the Hidden Garden of your heart. Yes, there are those who help: Sunday School teachers, pastors, spiritual counselors, and Christian friends. Yes, we are promised that the Spirit of Christ will empower and guide us. But if there is to be a garden, and not just a field of brambles inside us, it means we have to bring intentionality and regular attention to what grows there. Haphazard care just won’t get the job done. If we garden only when it’s convenient, the lack of attention will readily show, just as soon as a little stress is added. But if the Hidden Garden is tended well, then what a beautiful offering it becomes to the One who created it in the first place. In fact, the Hidden Garden of the heart may be the only thing we really have that we can give back to our Lord. And who knows, if well-tended, the harvest of blessings may be more than we can handle, just like the squash!